New Year's Eve is usually a good time for reflection, looking back, what happened, what didn't. I will spare you deep thoughts, as I am quite tired. New Year's Eve is also a good time to look into the future, plans, intentions, and ambitions. As I am not good at predicting the future, I will spare you those thoughts as well. What I will tell you is, that E! and I will continue working hard to open Gunk Haus. 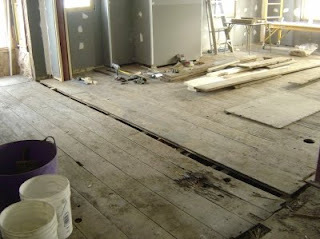 Work on the bar floor continued, and it is taking its sweet time. I have three rows down (to the right of the gap in the floor), and started to harvest two rows in the garret, which will replace the gap and the two damaged rows to the left of the gap. I wish you all a Happy New Year. A happy NewYear to you and E!!!! May your new year be even better than you imagined!!! !